Gene, like so many rock ‘n’ roll musicians from the South, grew up listening to a heady mix of country music, gospel and the blues. He fused it into a style of rockabilly that had a harder edge than almost any of his contemporaries. But for his accident, Vincent may never have entertained a career in music, choosing instead to remain in the US Navy. He was more popular in Britain than in America, although even in Britain he ended up undermining his success with some erratic behaviour. Born in Norfolk, Virginia, Gene Vincent first became interested in music while his parents were running a country store in Munden Point near the North Carolina border. In 1952 the family moved back to Norfolk and 17-year-old Gene joined the US Navy as a boiler man. Having served in the Korean War, he never saw combat, Gene used the money he received on re-enlisting to buy himself a Triumph motorbike. One day a car ran a red light knocking him off his motorcycle and smashed his left leg; amputation seemed likely, but in the event his leg was saved, but Gene was left with a permanent limp. He was invalided out of the Navy in 1955 and shortly afterwards he went to see Hank Snow's All Star Jamboree in Norfolk, it featured country artists like Cowboy Copas the Louvin Brothers and a new young singer named Elvis Presley. Inspired, Vincent began hanging around the local radio station WCMS, occasionally singing with the house band, The Virginians. He began appearing more regularly, singing a song called ‘Be Bop A Lula’, he had written with Donald Graves who had been in the naval hospital with him. ‘Sheriff’ Tex Davis a local disc jockey bought Graves share for $25 and signed Vincent to a management deal. In early 1956 a backing group was formed from The Virginians, comprising 26 year old Cliff Gallup, lead guitar; Willie WIlliams, rhythm guitar; Jack Neal, double bass; and 15 year old Dickie "Be Bop" Harrell on drums. Davis knew that Capital Records were looking for their own Elvis so he sent a tape to producer Ken Nelson, soon after Vincent and his group, now dubbed The Blue Caps were signed. Ironically, Capitol did not rate ‘Be Bop A Lula’ as an a-side; instead they picked ‘Woman Love’. Bill Lowery who had signed Gene to a publishing deal was convinced that ‘Be Bop A Lula’ was much better and he pressed copies to send to radio stations in advance of Capitol’s release. When it came out the record was flipped and ‘Be Bop A Lula’ went to No.7 in America and No.16 in Britain. The record rated No. 102 on Rolling Stone magazine's ‘500 Greatest Rock and Roll Songs of All Time’ list. Before 1956 was over, out came Gene’s follow-up, the excellent ‘Race with the Devil’ that barely bothered the Billboard chart getting to No.96 for just a single week. In Britain it did better making it to No.28 but that’s still relatively poor. The opening guitar run by Cliff Gallup is innovative and the whole feel of the song, while redolent of ‘Be Bop A Lula’ shouts hit. In all, Gallup played on well over 30 records by Vincent and it is his brilliant playing that did a lot to set these records about from other rockabilly influenced musicians. However, Gallup was married and gave up touring with the Blue Caps by the end of 1956, just undertaking studio work. ‘Blue Jean Bop’ quickly followed but it failed to make any impression on the Billboard chart, but did better in Britain reaching No.16. Besides Gallup, Willie Williams had also left and the new line-up is the one that appears with Gene in the Jayne Mansfield film The Girl Can't Help It. By the end of 1956 Vincent’s leg was in a bad way, probably due in part to his hectic work schedule, he had also severed his relationship with his manager. His first record of 1957 was ‘Lotta Lovin’, which made No. 23 on the Billboard chart. Strangely neither that nor the follow up, ‘Dance to the Bop’ that got to No.23 on the Billboard chart did anything in the UK. In late 1958 the Blue Caps, although with a very different line-up, did their last recording session with Vincent, Although the session brought great records including ‘Say Mama’ and ‘I Got To Get You Out’ as well as ‘My Heart’ none of the records did anything on the singles chart in America. Still popular in Britain he was invited to appear on the British TV show Boy Meets Girls by its producer Jack Good, Vincent arrived in Britain in December 1959, Good set about changing Gene’s image; dressing him in black leather with a gold medallion like a latter day Richard Ill. Early in 1960 ‘Wild Cat’ got to No.21 in the UK, followed by ‘My Heart’, No.16, during this time Vincent and his pal Eddie Cochran were touring Britain together. It was at the end of the tour that Cochran was tragically killed. Gene's next hit ‘Pistol Packin' Mama’ was to have been a duet with Cochran, but instead Vincent cut it alone at EMI's Abbey Road studios backed by The Beat Boys with Clive Powell (later Georgie Fame) on piano. His next UK hit was ‘She She Little Sheila’ No.22 a song featuring Sandy Nelson on drums that had been recorded back in 1959. Another Abbey Road session produced his final UK hit ‘I'm Going Home’, backed by Sounds Incorporated, they were also supporting him on the road and backed him on ‘Spaceship To Mars’ the song he sang in the film It's Trad Dad. Further singles failed to register despite Vincent performing ‘Temptation Baby’ the b-side of the latter track in Joe Meek's film Live It Up. The homage paid to Vincent by the Beatles kept his collateral high in a changing scene. By the mid 60's Gene was increasingly dogged by personal and health problems – not least his excessive drinking – and his records became more country flavored; he was backed by the likes of Glen Campbell, AI Casey, David Gates, Dash Crofts and Jimmy Seals. Performing live in the UK around this time his tour manager was Peter Grant, the future manager of Led Zeppelin. Grant waged a constant battle to keep Vincent sober enough to perform. On one occasion he strapped him to the mic stand, that was all that was holding the drunk Vincent up when the curtain opened. He got as far as singing “Be-Pop“ then fell straightforward and hit his nose covering the stage with blood. From 1969 to 1971 he toured Britain, but hard drinking and a severe ulcer led to Vincent's death in Newhall, California on 12th October 1971. A few years later John Lennon honored his memory recording ‘Be Bop A Lula’; it was the song he played the only time his mother Julia saw him perform, and also the first time he met Paul McCartney – rock ‘n’ roll don’t come more meaningful. In the 1993 Jeff Beck recorded an entire album of Vincent’s songs, which was also his nod to Cliff Gallup’s skills; in 1998 Gene was inducted into the Rock and Roll Hall of Fame. This two-fer from EMI features a pair of out of print Gene Vincent LPs: Blue Jean Bop! and Rocks and the Blue Caps Roll!, originally issued on Capitol in 1956 and 1957, respectively. Highlights among the 24 rockabilly tracks include "Who Slapped John?," "Blue Jean Bop," "Jezebel," and the Hank Williams standard "Your Cheatin' Heart." What can you say about a 26-cut Gene Vincent collection that gives you most of what you'd ever want? This is not for the collector, and may be more than the very casual fan bargained for, but for everybody else, this set is pure rockabilly gold -- in other words, close to perfect. Thankfully, the wise person at EMI who assembled this left "Be-Bop-A-Lula" until the very end, giving listeners a chance to experience Vincent's amazing range, from the smoking "Race with the Devil" to the finger-popping "Red Blue Jeans and a Pony Tail" to the country boogie of "Who Slapped John?" to the jukebox jumpin' "Dance to the Bop," with some key love songs thrown into the mix -- rather than saturating it -- as well. For the price, you can't beat this one. 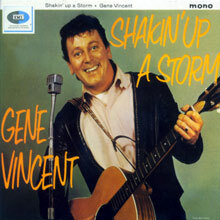 Virtually everything on Gene Vincent's final EMI album, Shakin' Up a Storm, is superb, representing some of his best rock & roll from a decade in which he went years between albums. Cut with the backing group the Shouts and released only in England, Shakin' Up a Storm is an unusual record, containing elements of the burgeoning Merseybeat sound and soft-rock covers of country songs. The album (which has been reissued as part of EMI's 100th Anniversary series, in glittering 24-bit sound) starts off well with a raucous "Hey Hey Hey," fueled by the fiery saxwork of Jim Field. It then switches gears on "Lavender Blue," a soft ballad that was more Elvis Presley's speed (though Vincent does surprisingly well, singing as softly as he knows how), before launching into the rockabilly-style "Private Detective," on which Tim Bates' lead guitar shines. "Shimmy Shammy Shingle" is a thumping number that, with a heavier bass sound, could've passed for a Liverpool-style rocker, and "Someday (You'll Want Me to Want You)" is a decent cover of a pop standard. Vincent's abilities as an R&B singer -- showcased on his magnificent 1963 single "Where Have You Been All My Life" -- are highlighted several times on Shakin' Up a Storm, most notably on a cover of Sam Cooke's "Another Saturday Night," on which Vincent's voice is richly expressive and the mix of rhythm guitar and organ accompaniment adds a nice, new wrinkle to the song. "Slippin' & Slidin'," featuring Bates' rippling lead guitar and a great vocal performance from Vincent, is a stomping rocker that could've passed for a first-rate Merseybeat track. Vincent also does well with "Send Me Some Lovin'," which allows him to stretch out vocally in front of a sax and rhythm guitar arrangement. "Love Love Love," with its multi-tracked vocals and bouncy rhythm guitar part, sounds like a direct attempt to emulate the Merseybeat sound. It opens a series of songs that ought to have given Vincent's detractors pause; he might not have charted a record in a couple of years when this album was issued -- even in England -- but he could still generate exciting music in almost any rock & roll idiom. 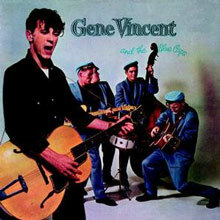 "Baby Blue," co-authored by Vincent and featuring pounding support by the Shouts, sounds like it was snatched straight out of one of Gene's 1957 sessions. The producers could've ended Shakin' Up a Storm with the blazing "Suzie Q," but instead they threw on one more number, a hard-rocking rendition of Jimmie Davis' "You Are My Sunshine." Featuring Victor Clarke's heavy drumming, Field's honking sax, and a hot performance by organist Erik Baker, the song nonetheless belongs to Vincent, who transforms this country-pop classic into a serious rock & roll screamer. Gene Vincent may have been one of rock & roll's first great Dixie-fried wild men, but consistency was not his strong suit, and for every work of lunatic genius in his catalog (such as "B-I-Bickey-Bi, Bo-Bo-Go" and "Woman Love"), there are a few failed ballads and novelty tunes foisted upon him by clueless A&R men back in the day. This compilation from Capitol Records' fine Collectors Series line represents a noble and largely successful attempt to skim off the cream from his Capitol masters; while the material has been remixed for compact disc release, the new versions honor the sound and spirit of the original (though the mono versions have a shade more punch), and the track listing offers plenty of meat with little filler. While Razor & Tie's later collection The Screaming End: The Best of Gene Vincent rocks harder, Capitol Collectors Series in many ways offers a more accurate look at Vincent's career, with the wildness starting to seriously fade near the end of the disc without skidding into his really dire material. Even on the lesser tunes, Vincent's gloriously prurient vocals are upfront throughout, and the superb fretwork of Cliff Gallup, Paul Peek, and John Meeks prove the guy had great taste in guitar players. Added bonus: an instrumental take of "Rocky Road Blues" that will help make you the coolest person at karaoke night. 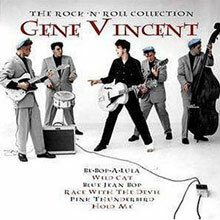 Gene Vincent's very first album, cut in June 1956, was a rushed affair -- which is obvious from the haphazard song selection -- but manages to be one of the most exciting LPs to come out of the early rock & roll era, rivaling Elvis Presley's first two albums, which date from the same period. Its virtues, which is to say, the virtues of Gene Vincent and His Blue Caps as high energy rock & rollers, transcend the lack of quality songs on the album -- the title hit is joined by some rocked up standards ("Lazy River," "Peg O' My Heart," and "Ain't She Sweet," which the Beatles picked up in their early repertory by way of Vincent, and made their first vocal recording five years later), a country ballad ("Wedding Bells") or two, and some hastily written rave-ups ("Jumps, Giggles and Shouts," etc. ), little of it high-grade rock & roll material in and of itself. As it turned out, Vincent and his band didn't need first-rate songs to produce great rock & roll -- they rise to the occasion here, throwing the hard rocking numbers into the air like the musical equivalent of jitterbug dancing, or stretching out elegantly on the handful of ballads, and the result is one of the few truly virtuoso rock & roll albums of the era. What sets Bluejean Bop apart from Elvis' albums, in particular, and most other white rock & roll of the period, is that it has the tight sound of an actual working band, where Elvis' (and most other white rock & rollers') albums, in particular, almost inevitably featured session players whose presence helped make for an idealized recording, but not a good representation of how they sounded on stage -- which is what rock & roll was really about. Vincent and company, by contrast, were playing shows virtually every night during the period of these sessions. The sessions themselves were done in a hurry, without any help from studio musicians; and they were conducted with minimal input from producer Ken Nelson, who pretty much let the band do what came naturally. The result is a lean, tight sound, akin to a live recording -- which this practically was -- in terms of minimal retakes, lots of spontaneity, and no overdubbing. 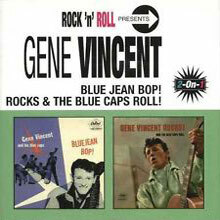 Bluejean Bop was reissued in 1998 by Collectables Records, paired off with Vincent's next album, Gene Vincent & His Blue Caps, on the same CD, as Bluejean Bop/Gene Vincent & His Blue Caps. 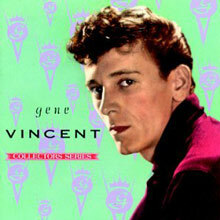 Gene Vincent and His Blue Caps, cut in October 1956, only four months after its predecessor, came about under slightly less favorable circumstances than the Bluejean Bop album. Cliff Gallup, whose lead guitar had been so central to the group's original sound, and rhythm guitarist Willie Williams, who was only somewhat less important to their sound, had been gone from the band for nearly two months when producer Ken Nelson decided it was time to cut material for more singles and a second album. Gallup was persuaded to rejoin temporarily for the sessions that yielded this album, and with him he brought not only a hot-sounding instrument but one first-rate original song, "You Better Believe," alongside a few other notable band originals ("Cruisin'," "Hold Me, Hug Me, Rock Me") that are among the best songs Vincent and his band ever recorded. The sound ends up similar to the Bluejean Bop album, with a little more depth in places and Vincent showing more maturity and confidence, which is how he gets away with "Unchained Melody," the most challenging ballad he'd cut up to that time -- Gallup's trilled, mandolin-like playing (which turns up on "I Sure Miss You" as well) also serves to make this one of the more unusual and memorable of the many good versions of this song. Vincent's singing also stands out on his dark, moody, ominous rendition of the Delmore Brothers' "Blues Stay Away From Me." And the band runs circles around virtually every other white rock & roll outfit of the period. Unfortunately, Gene Vincent & His Blue Caps would also be the last time that this version of the band would turn up on record with Vincent -- Gallup soon left again, and in less than three months, every member of the group except drummer Dickie Harrell would be gone. 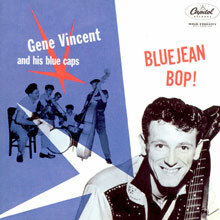 In 1998, Collectables Records reissued this album, paired with Bluejean Bop, on Bluejean Bop/Gene Vincent & His Blue Caps.